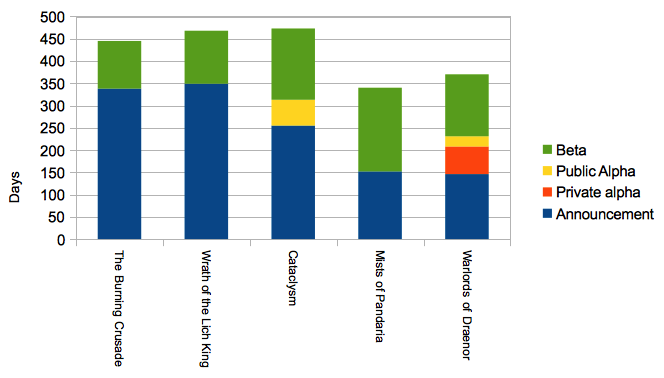 Now that we have the date of release for Warlords we can finally do some comparisons with how Mists has stacked up against other expanisons. There is also the question of when the 6.0 systems patch is released which has not been announced yet. This has all of the systems changes, but none of the Draenor content or an increase in the level cap. The achievements for clearing Seige of Orgrimmar on normal and heroic become feats of strength – thus the mount and titles will no longer be attainable. We’ve had a comment from Tom Chilton that the systems patch will be “ Around a month before Warlords of Draenor “. This matches up to the gap between systems patch and expansion for Wrath and Mists – they were 30 and 28 days respectively. 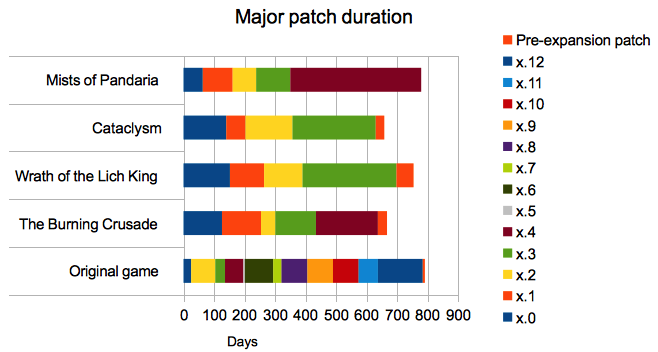 The mean is 30¼ days, with the two months for Cata being pulled back by the 7 days of TBC systems patch. This will place the systems patch around the 14th / 15th October – it’ll be interesting to see how that stacks up against the dates when they are announced. If the systems patch is on the 14th October we only have nine raid resets – including the current one – to finish off challenge modes, SoO bosses, etc. That is all just speculation however – we need to wait for Blizzard to make the formal announcements. What we can look at is what Warlords being released on the 13th November means for Mists of Pandaria. Here we can see that Mists of Pandaria will have been the longest expansion to date, beating Wrath by 25 days. It will only be 5 days from equaling the duration of Vanilla. We can also see how the early rush of patches in Mists has meant that 5.4 has been the longest patch so far in the game. It is worth noting that Warlords is considered by Blizzard to be around 6 months late – it should’ve released back in May 2014. If that did happen, then Mists of Pandaria would’ve ended up being the shortest expansion. And Seige of Orgrimmar would’ve lasted only 10 days longer than Sunwell, well behind the duration of Icecrown Citadel and Dragonsoul. If we only look at raid tiers, we can see that The Burning Crusade and Wrath had four raid tiers. 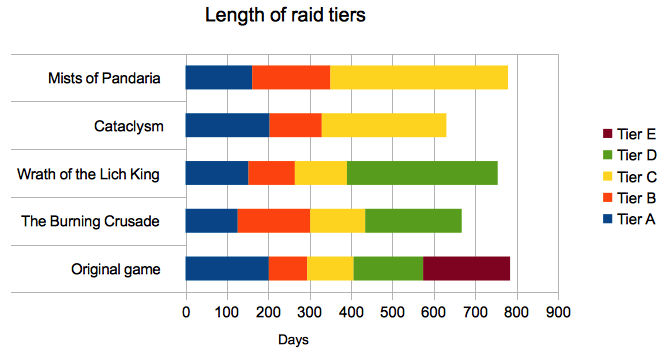 In the case of Wrath, the four raid tiers made ICC feel shorter. I’ve not counted Ruby Sanctum as a separate raid tier – its time is combined with ICC. Mostly due to Ruby Sanctum being a bit of an afterthought raid in most raiders’ eyes. The move to three raid tiers in Cata did mean that Dragonsoul ended up being very long. This was just accentuated in Mists. However if Blizzard had released Warlords 6 months earlier as they wanted to, the three tier system would’ve worked out nicely. Tom Chilton made an interesting comment during a GamesCon interview – Blizzard consider the sweet spot for a raid tier is 4 to 5 months. The orange bars on the graph above shows the 4 and 5 month points for comparison. 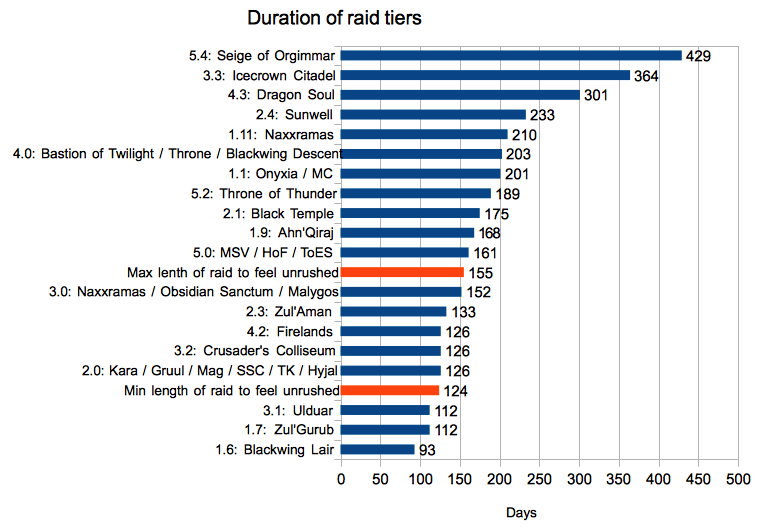 However there are 11 raid tiers longer than 5 months – the median raid tier duration is 168 days, around 5½ months long. Of note is Ulduar, which felt far too rushed. I think most guilds would’ve happily spent at least a couple more months in there. Especially compared to the “ Raid in a circular room ” the Crusaders Colliseum which followed. We didn’t even have trash to break up the “ boss after boss after boss after… ” which that place had. It did however show one thing – whilst too much trash can be bad, insufficent trash can be just as bad! We wouldn’t want to go back to the Molten Core Imps fast respawn trash – that was a pain! After killing Magmadar, most Alliance raid groups would portal back to Ironforge & travel back to Molten Core as it was faster than the run from Magmadar via the imps! The problem Ulduar faced was the moment TotC dropped, people no longer wanted to raid in Ulduar, even if they’d not finished it yet. To me, it was a wasted raid instance. Worse still, its a beautiful place to raid with some fun boss fights. The above graph also really brings home how long we’ll have been in Seige of Orgrimmar by the time Warlords is released. The graph does show how time from announcement until release was slowly going up until Mists of Pandaria. That had a relatively fast public development process. The amount of time spent in beta has slowly been going up as well – with Warlords having the longest time in beta. Warlords is also notable in that they announced the private alpha. They did say this was so that people could test at home so the files would appear on Battle.Net, but the sysadmin in me did kind of wonder at that. Part of me does wonder if it was so they could show people something about Warlords given that they knew development was delayed by six months. This entry was posted in Mists of Pandaria, Numbers, Warlords of Draenor and tagged Mists, Warlords of Draenor, World of Warcraft. Bookmark the permalink.